For the first time, the International Wing Chun Martial Art - Indonesia will conduct public classes in cooperation with Gold's Gym Indonesia. The Classes will be held once a week in 2 Gold's Gym locations, Thamrin City every Friday @ 6:30PM and Pantai Indah Kapuk every Saturday @7:30AM. The Special Demo Classes will be held in Gold's Gym Thamrin City on May 20th, 2011 @ 6:30PM and Gold's Gym Pantai Indah Kapuk on May 21st, 2011 @ 8:00 AM. UPDATE: We've closed the Public Classes. 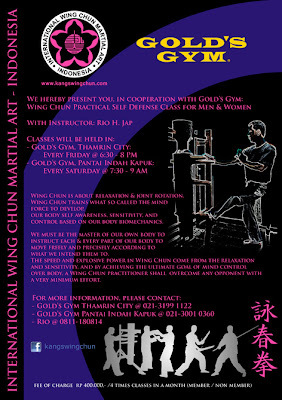 For further info on Wingchun Trainings, please click on this link.